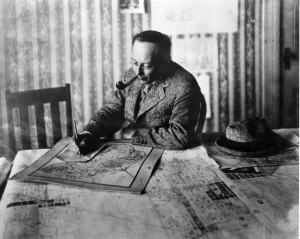 Frederick Law Olmsted, Sr. believed that the built environment could promote democratic values and behaviors. He put this belief into practice, designing public parks to be accessible to all, places that allowed rich and poor to come together for recreation and sociability. Olmsted also advocated for the creation of public parks in towns and cities across the country, speaking with civic leaders, civic associations, and city officials. Through his actions, public parks and parkways became important civic institutions, guiding the expansion and renewal of cities in the 20th century. While still embodying democratic ideals, what was missing in these park systems was a democratic voice; decisions and designs were created from the “top down” by civic leaders who were typically white, male, and often wealthy. 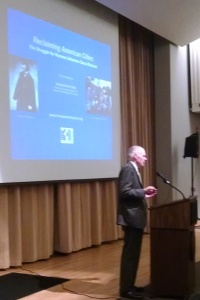 Rutherford Platt presenting on the concept of a Humane Metropolis. 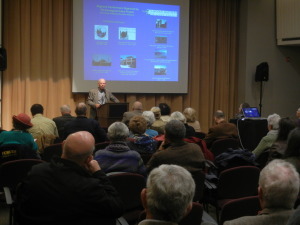 On Saturday, November 8, 2014,Rutherford Platt offered ideas for adding a democratic voice in his talk “Reclaiming American Cities” at the Maryland Historical Society. Co-sponsored by the Friends of Maryland’s Olmsted Parks and Landscapes (FMOPL), Baltimore City Historical Society, and the Maryland Historical Society, Platt’s talk was a follow-up to his conference “The Humane Metropolis” held in Baltimore in 2009. The idea behind the humane metropolis is to re-imagine our cities in a participatory manner, creating places that are green, healthy, safe, efficient (in the use of resources), equitable, and neighborly. To achieve these goals, cities need to embrace grass-roots, bottom-up efforts rather than simply a benevolent top-down approach. 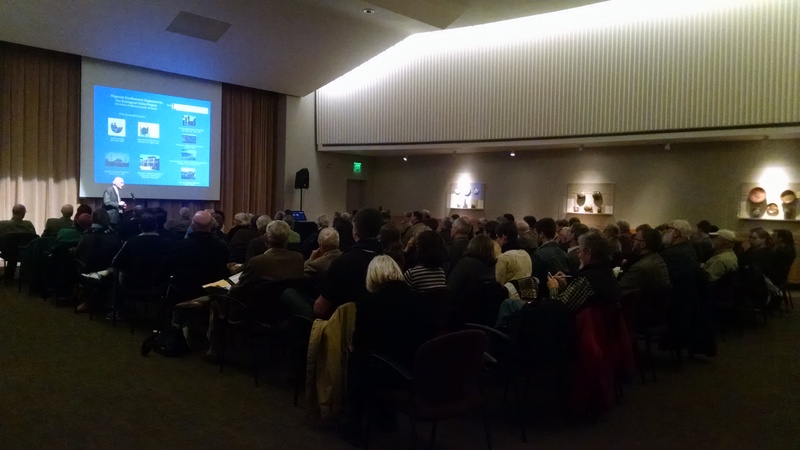 Pratt provided several case studies from the past century that highlighted both approaches – Chicago’s Columbian Exposition and Hull House, Robert Moses and Jane Jacobs in New York were but a few. He concluded his talk by offering that in order for grass-roots efforts to be effective, what was needed were enlightened leaders (at the city and community levels), trust and cooperation, innovative institutions, funding, and community participation. As exemplified by Olmsted, a top-down vision, and ability to fund and execute that vision, can result in wonderful places. However, grass-roots, community-based approaches as highlighted by Platt, can also be successful. While both are needed, what is the relationship between the two? How do we create a “both-and” rather than an “either-or”? One example that was briefly mentioned was the creation of the High Line, which started as a grass-roots effort to reclaim the abandoned rail line but required civic leadership and funding to become a reality. The mission of FMOPL is to celebrate the Olmsted legacy in Baltimore and to promote those Olmstedian principles that are still relevant and needed today, in particular the creation of democratic spaces in the broadest sense of the term. 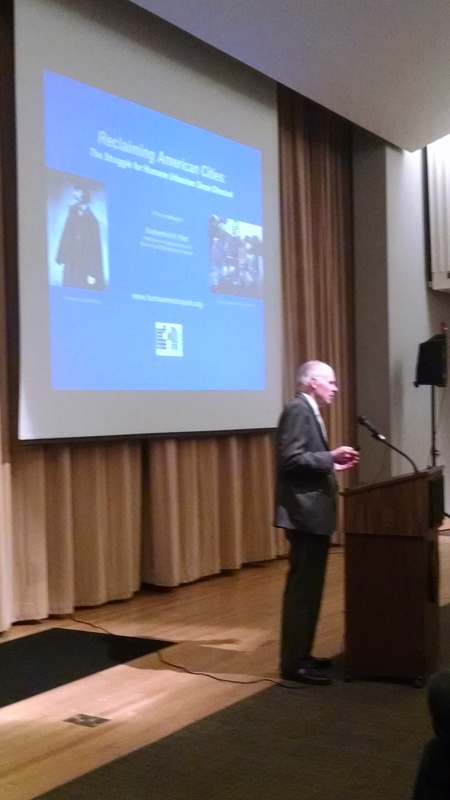 Platt offers important touchstones for achieving this vision and helping to re-create Baltimore in a humane manner. Rutherford Platt speaking to a packed house at the Maryland Historical Society. 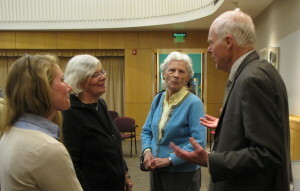 Platt speaking with folks after the event. Ed Orser, FMOPL President, welcoming attendees and introducing Platt. Previous PostNew spring walking tour of Clifton Park on May 4!